My friends and I started collecting t-shirts long before this business began. 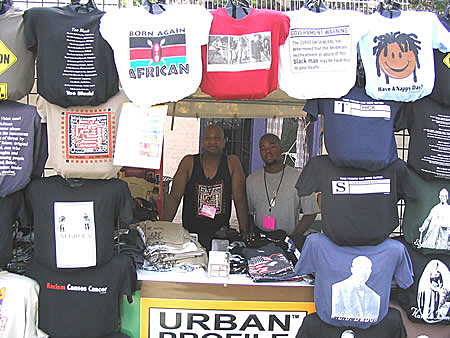 We used to buy shirts every summer at the African Festivals held in Hart Plaza in Detroit. Or, we might find a street vendor with something interesting. (Unfortunately, those festivals aren’t around anymore. And neither are the street vendors.) Those were the days before laptop computers and mobile phones. Shopping on the internet didn’t exist yet. It was a little more difficult to find good t-shirts back then: a lot of people were wearing really badly printed Malcolm X knock-offs. And we could only get away with wearing our “Black by Popular Demand” t-shirts just so many times before that got old too. The only new designs we could find were “Hip Hop style" Loony Tunes Characters; stuff like Bugs Bunny wearing gold chains, MC Hammer pants, and smokin' a joint. (Not good.) It was hard to find anything that represented how we felt or what we wanted to say. 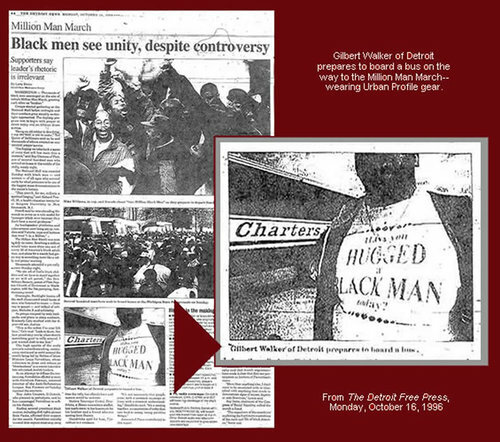 t-shirts (from the Detroit Free Press, 1996). Twenty years ago (around the time of the Million Man March in Washington, DC), we decided to come up with a few concepts, had them printed, sold a few, and gave the rest away. It was just for fun and for ourselves. But, the responses we received were very positive, so we made more. Eventually, we began selling T-shirts at various fairs and festivals in Detroit, Chicago, and a few other places... and here we are 20 years later. Time has passed... it used to be difficult to find T-shirts that represented Black culture, but not anymore. Now there are many places to purchase Black t-shirts, primarily because of the internet. Online shopping has allowed for greater variety and choice, which is a good thing. But, even with all that variety, it's still difficult to find really good t-shirts; the kind that truly represent our thoughts and feelings, or accurately chronicle the African American experience. That’s what we are trying to accomplish. Urban Profile T-shirts is committed to making and selling T-shirts that speak the truth about our history, culture, and condition. One more thing: We will only carry quality T-shirts. We really can't stand cheap t-shirts, and we're sure you don't like them either. If you've ever purchased a thin, awkwardly fitting $35.00 or $40.00 dollar (way overpriced) t-shirt at a concert for example, only to have it fall apart, or shrink up on you after washing it a couple of times, then you know what we mean. We decided from the start that it just didn’t make sense to use poor quality t-shirts or work with printers and suppliers who are sloppy, inconsistent, and use cut-rate materials. The shirts we design ourselves are printed using 100% quality cotton t-shirts, and our licensed distributors also use high quality t-shirts as well. Bottom Line: We refuse to make or sell (or wear) that cheap stuff.